"I believe victory is closer than ever before." WASHINGTON — With metronomic regularity, every thousand days or so, Americans should give some thought to the longest war in their nation's history. 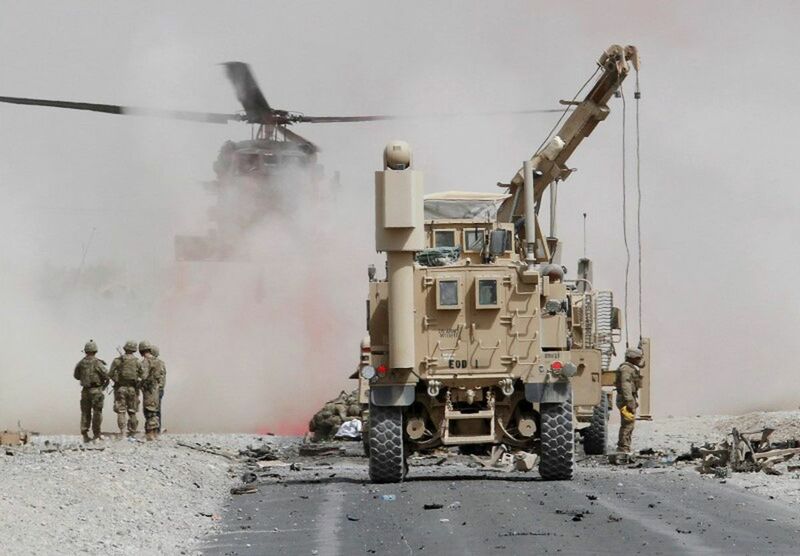 The war in Afghanistan, which is becoming one of the longest in world history, reaches its 6,000th day on Monday, when it will have ground on for substantially more than four times longer than U.S. involvement in World War II from Pearl Harbor to V-J Day (1,346 days). This fascinating, if dispiriting, story is told in Steve Coll's new book "Directorate S: The CIA and America's Secret Wars in Afghanistan and Pakistan." There cannot be many secrets about this subject that are not in Coll's almost 700 pages. He reports when Gen. Stanley McChrystal went to Afghanistan in May 2002, "A senior Army officer in Washington told him, 'Don't build (Bondsteels),' referring to the NATO base in (Kosovo) that Rumsfeld saw as a symbol of peacekeeping mission creep. The officer warned McChrystal against 'anything here that looks permanent. … We are not staying long.' As McChrystal took the lay of the land, 'I felt like we were high-school students who had wandered into a Mafia-owned bar.'" It has been a learning experience. After blowing up tunnels, some almost as long as a football field, that were thought to be created by and for terrorists, U.S. officials learned that they were an ancient irrigation system. A decade ago, seven years after the war began on Oct. 7, 2001, then-Secretary of Defense Robert Gates said the U.S. objective was the creation of a strong central government. When he was asked if Afghanistan had ever had one, he answered without hesitation: "No." Which is still true. Years have passed since the time when, years into the war, U.S. military and civilian officials heatedly debated "counterinsurgency" as contrasted with "counterterrorism," distinctions that now seem less than crucial. Coll says of military commanders rotating in and out of Afghanistan annually, "The commanders starting a rotation would say, 'This is going to be difficult.' Six months later, they'd say, 'We might be turning a corner.' At the end of their rotation, they would say, 'We have achieved irreversible momentum.' Then the next command group coming in would pronounce, 'This is going to be difficult. … '" The earnestness and valor that Americans have brought to Afghanistan are as heartbreaking as they are admirable. For 73 years, U.S. troops have been on the Rhine, where their presence helped win the Cold War and now serves vital U.S. interests as Vladimir Putin ignites Cold War 2.0. Significant numbers of U.S. troops have been in South Korea for 68 years, and few people are foolish enough to doubt the usefulness of this deployment, or to think that it will or should end soon. It is conceivable, and conceivably desirable, that U.S. forces will be in Afghanistan, lending intelligence, logistical and even lethal support to that nation's military and security forces for another 1,000, perhaps 6,000, days. It would, however, be helpful to have an explanation of U.S. interests and objectives beyond vice presidential boilerplate about how "We will see it through to the end." And (to U.S. troops) how "the road before you is promising." And how the president has "unleashed the full range of American military might." And how "reality and facts and a relentless pursuit of victory will guide us." And how U.S. forces have "crushed the enemy in the field" (or at least "put the Taliban on the defensive") in "this fight for freedom in Afghanistan," where Bagram airfield is "a beacon of freedom." If the U.S. objective is freedom there rather than security here, or if the theory is that the latter somehow depends on the former, the administration should clearly say so, and defend those propositions, or liquidate this undertaking that has, so far, cost about $1 trillion and 2,200 American lives. George Will writes a column on politics and domestic and foreign affairs for The Washington Post. He received the Pulitzer Prize for Commentary in 1977.